Shielding fabric from our Electrosmog PRO canopy. 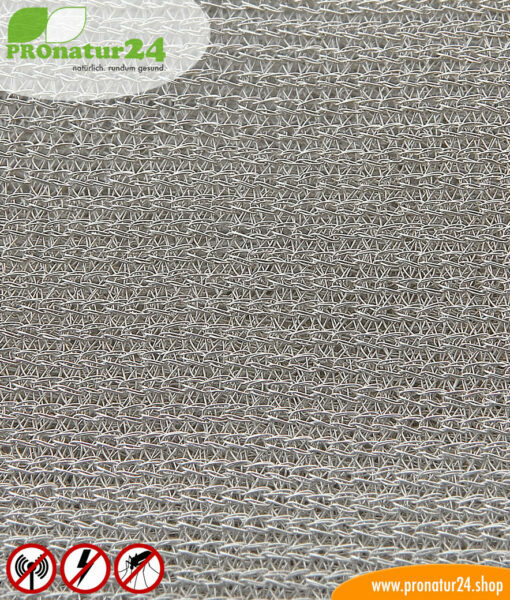 Half-transparent, silver-plated nylon fabric, up to 50 dB attenuation. Strong silvering. Very durable. Can be grounded. This SILVER TULLE shielding fabric has a very high shielding efficiency – comparable to our T98 shielding paint. 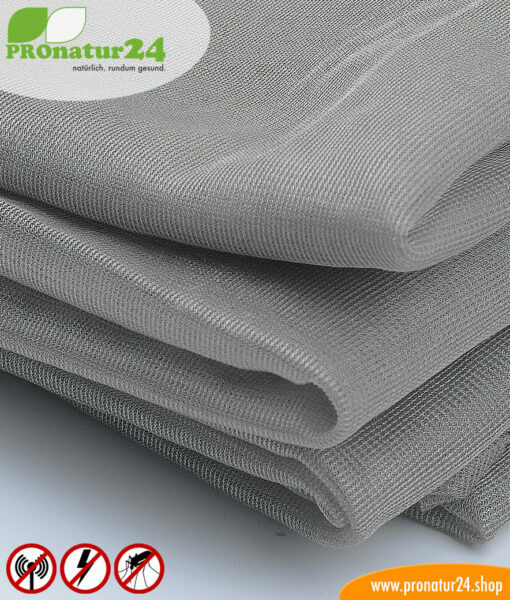 The shielding fabric is a transparent, strongly-silvered nylon fabric for general protection against electrosmog. This particular shielding fabric manages to effortlessly reflect high-frequency electromagnetic radiations (HF) and ground low-frequency alternating fields from the house power. We have been using the Silver Tulle shielding fabric for our Elektrosmog PRO canopy for a year. 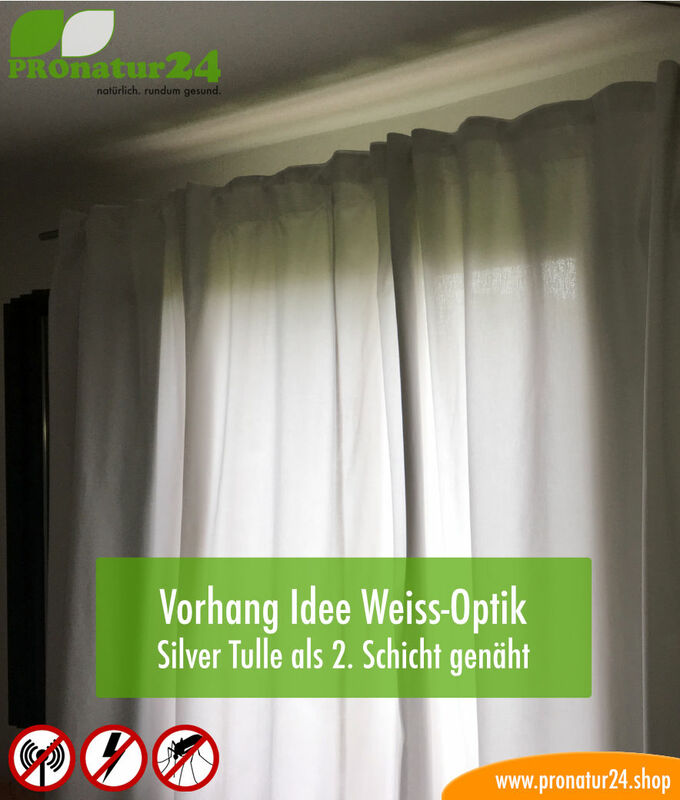 After several tests as curtains, we now recommend SILVER TULLE as a highly-effective shielding fabric for your windows as well. 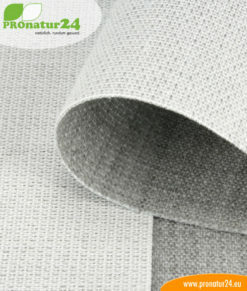 If the silver/beige colors bother you, the shielding fabric can also be sewn on “behind” opaque curtains, for example. The Silver Tulle shielding fabric is typically used in net curtains, as curtains, as room dividers in laboratories, medical practices, etc. and to sew a bed canopy because of its excellent washability. Because of a strong silvering, SILVER TULLE only loses a little bit of efficiency after washing or movement. Silver products have a limited shelf life, their lifespan depends on how often they are moved. 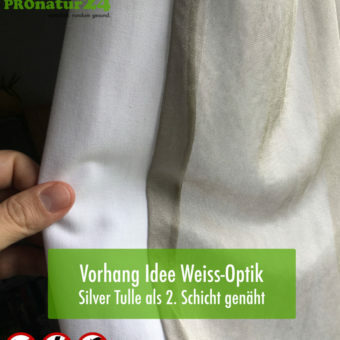 The silver in SILVER TULLE does not contain any nanosilver, but a thick, metallic silver layer. Good light transmission with very high screening attenuation. 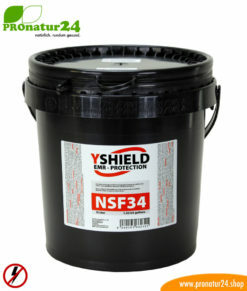 Can be contacted (grounded) to shield against electric fields (LF). Textile-like properties: washable, can be sewn. Exception: cannot be ironed! Wash at a gentle cycle at 30°C. Do not iron. Do not dry in the tumble dryer. Do not bleach. Do not dry clean. For allergic users: every new fabric smells, wash before its first use! We recommend our ecological, vegan UNI SAPON detergent. 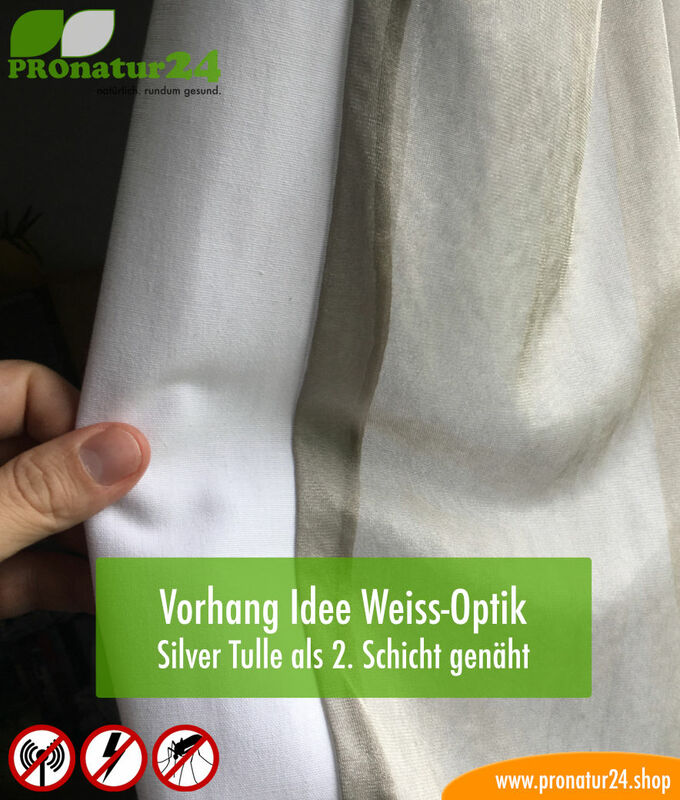 It should be noted that while the fabric with silver threads is highly effective, they change color as time goes on. Its quality and impact are not affected by this, it is, however, an optical change that can be covered in creative ways on curtains. Like for cuts, there is no right to return shielding fabrics. Please note that revocations do not apply to these products, because they were cut to the customer’s specifications. Reselling a tailored item is no longer possible. For this reason, it is possible to request a free sample. By ordering pre-finished products, waiving the statutory right to return goods is accepted. We only sell the highest-quality fabrics! Because of the high production costs and a favorable price, small flaws are not grounds for complaint. 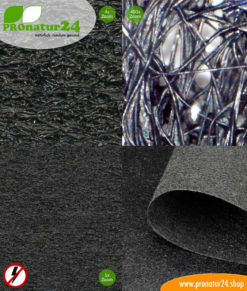 Highest attenuation with the used shielding fabric! The attenuation of electrosmog created by radio radiation is phenomenal! Over 50 db attenuaton up to 1 GHz, ie. radio, TV, Tetra, DVB-T, LTE, GSM 900, etc. Over 45 db attenuation up to 2.6 GHz, ie. 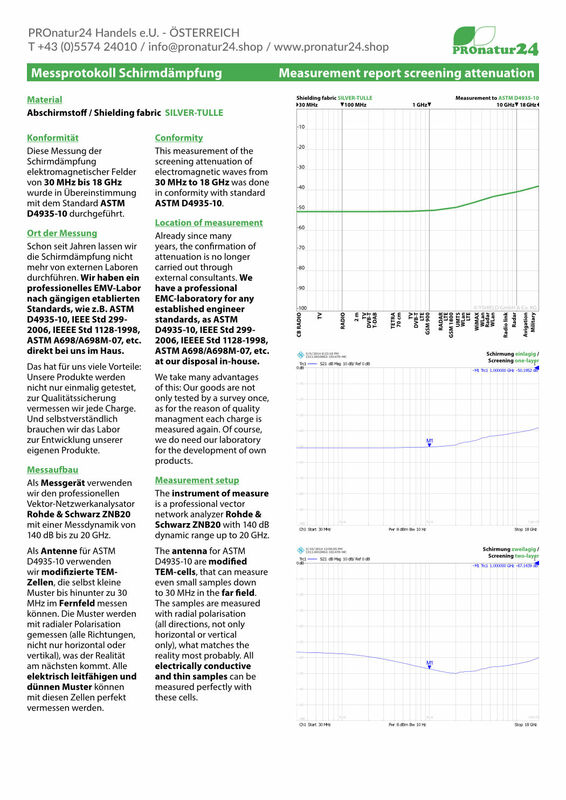 radar, LTE, GSM, UMTS, WLAN 2.4, WiMAX, etc. Over 40 db attenuation up to 10 GHz, ie. WLAN 5, radar, etc. The attenuation is still high for more than 10 GHz, at 38 db! 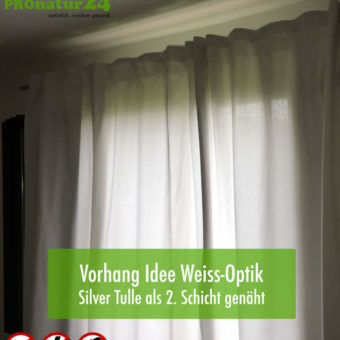 1 review for SILVER TULLE shielding fabric for curtains and canopies. Up to 50 dB attenuation of high-frequency radiation, can be grounded for LF protection. 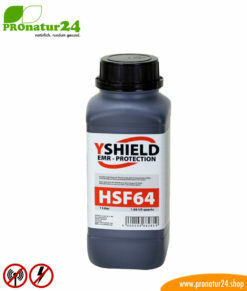 It is a good shielding fabric. When I put my mobile phone underneath it, the reception went down considerably, it was weaker. Good against radiations and radio, effective, in any case, it minimizes the radiations! Thank you! NCV95 shielding fleece with protection from electrosmog caused by LF electric fields. 80 dB screening attenuation.